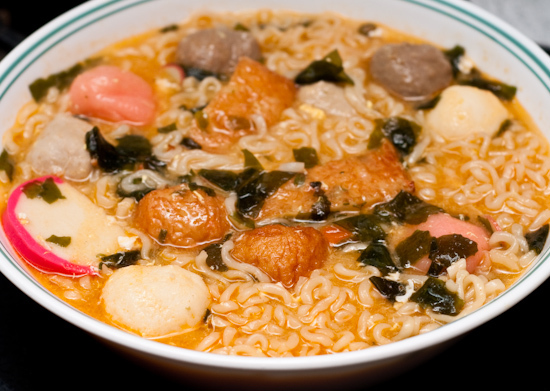 Lunch: Tina cooked some Nong Shim Seafood Ramyun with the extra meat balls and fish balls that we didn't use for hot pot the previous day. 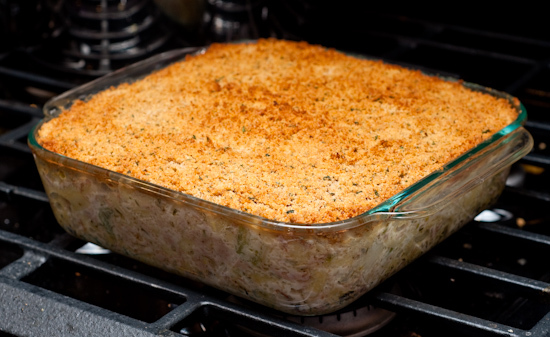 Dinner: Tina followed my recipe for Tuna Noodle Casserole (more or less) for a lovely dinner with plenty of leftovers. 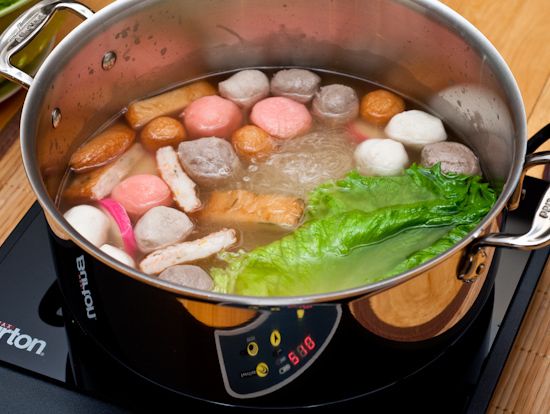 Lunch: Tired of cleaning the grooves in our hot pot (our hot pot has a non-stick finish, but the interior is ridged like a grill pan so thorough cleaning requires going into each groove), Tina decided to try to put together her own (superior) hot pot with a stainless steel clad pot set on a portable induction cooktop. This worked like a charm, providing her a pot that was easy to clean as well as digital temperature controls. 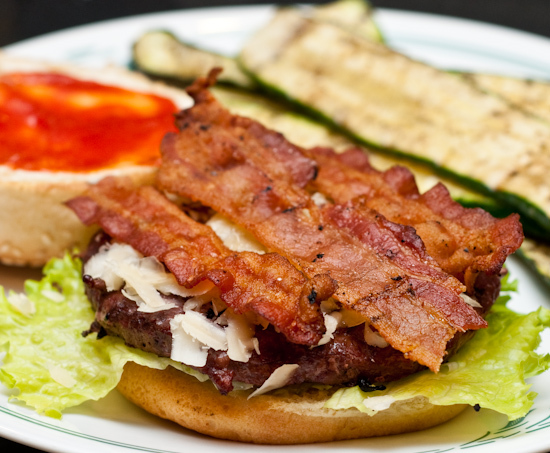 Dinner: I grilled up bacon cheeseburgers made from ground ostrich meat, three year aged sharp cheddar cheese, and hickory smoked uncured bacon. I also grilled up zucchini. These were excellent, but the ostrich meat was a bit lean for my taste. Tina spread some chopped avocado on and took the burger to the next level. 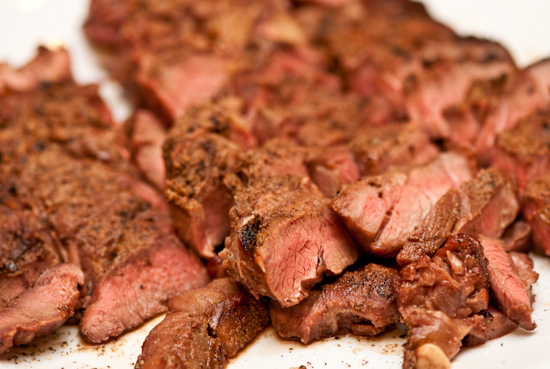 As a meat, ostrich has the texture of lean beef but with less flavor. Overall, it's a fairly mild tasting protein. 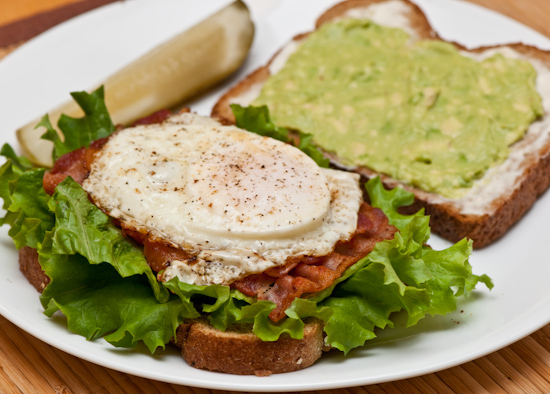 Lunch: Tina made an awesome bacon, avocado, and egg sandwich for lunch. 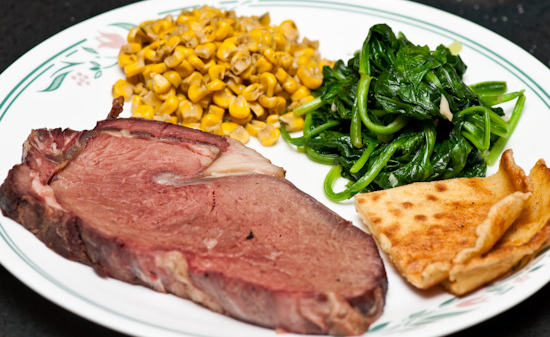 Dinner: We had the last of the Christmas dinner leftovers - prime rib, corn, sauteed fresh spinach, and Yorkshire pudding. Breakfast: We drove up to IKEA to take advantage of their one day sale on POÄNG chairs ($50 each instead of $90). 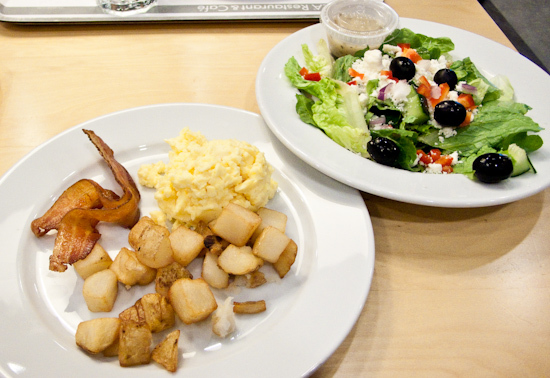 As part of their holiday deals, we also got free breakfast - some scrambled eggs like substance, potatoes, and two strips of bacon. We split a Greek salad as well. Lunch: After church, we went over to Chen's Noodle House (8650 Spicewood Springs Rd, Austin, TX‎ - (512) 336-8888‎). 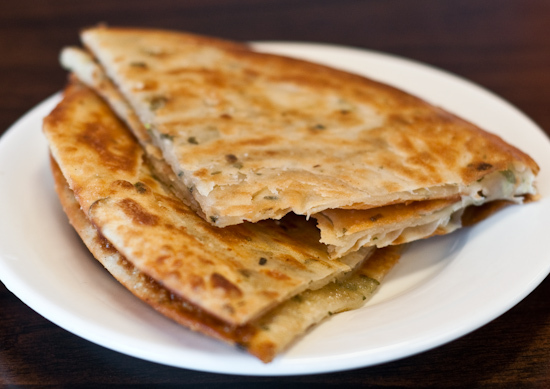 Extremely crispy and flaky cong you bing (scallion pancakes). When I bit into it, I immediately tasted something in the oil that I usually associate with sweet pastries, but I couldn't quite place it. It wasn't sweet - it was savory and had a decent amount of scallions, so I wasn't sure what it was. I remember last time tasting the same flavor (a flavor that I don't normally associate with Chinese food) in their cong you bing, but I didn't find out what it was that time. 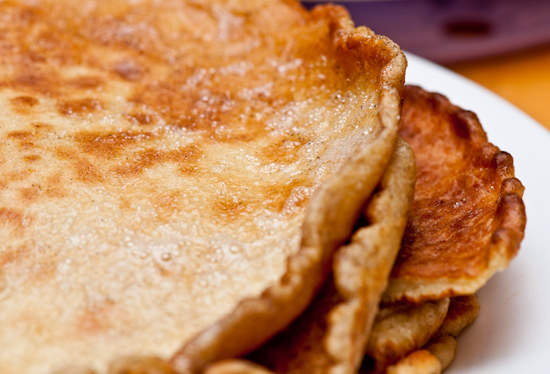 We asked this time and it turns out they add a tiny bit of butter (which is why it doesn't taste like Chinese food). Lunch: We headed off to the Barton Creek mall for some Day After Christmas Sale shopping and stopped in at Nordstrom Cafe Bistro for lunch. The last several times we ate here, the food has been excellent, but not today. The soup was fine, but the pasta dish was lacking and the pizza was merely okay. Dinner: Tina and I prepared a Christmas feast for… just the two of us. I decided to do a prime rib for Christmas dinner this year because I kept answering questions sent to me by other people trying to prepare a prime rib. It seemed like a good idea, but really for two people, you just end up with a lot of leftovers. 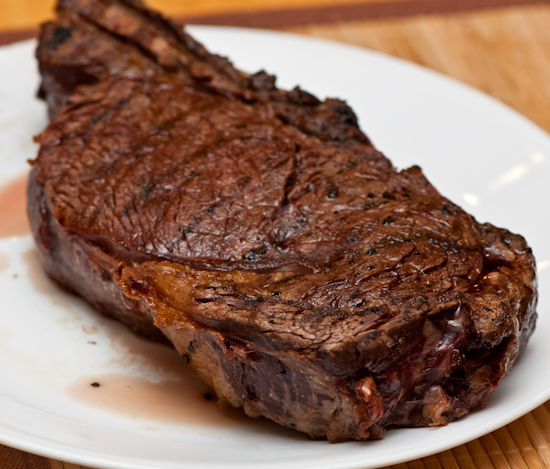 I picked up a one rib roast (which I would normally call a steak, but humor me) last night and started preparing dinner after we went to see Sherlock Holmes at 4:30pm. I grilled the roast over high heat to get a nice char on the outside and then finished it off over low indirect heat. Dinner: We had a rather disappointing meal at Aquarelle (606 Rio Grande Street, Austin, TX‎ - (512) 479-8117‎) which was in start contrast with our first meal at Aquarelle (during Austin Restaurant Week). The main reason I wanted to go back was the delicious but simple dinner rolls, but they didn't have the same addictive taste as they did during our last visit. 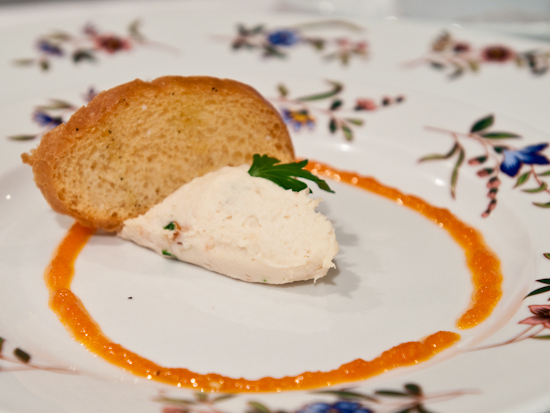 The started us with an amuse bouche of salmon mousse with sun-dried tomato vinaigrette. Good. Dinner: After Christmas service at our church, we went to Musashino Sushi Dokoro (3407 Greystone Drive, Austin, TX‎ - (512) 795-8593‎) to try their sushi. The place claims to serve sushi "Tokyo-style" which, I took to mean, how they eat sushi in Japan. As far as I know (having only had sushi in Japan once in the Roppongi district of Tokyo), the etiquette is to use your fingers to eat sushi. Nigiri is made with wasabi already placed underneath the fish (on top of the rice), so only a light dipping in soy sauce is needed. 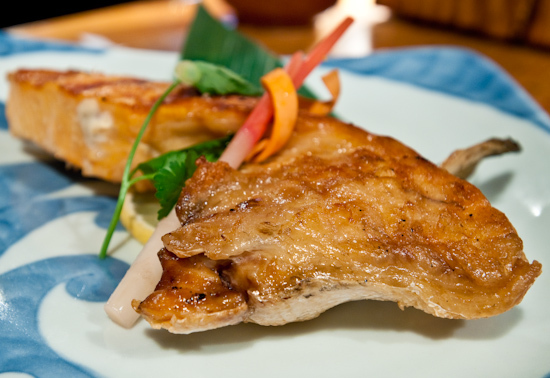 The nigiri is placed in the mouth fish side down in the mouth so the flavor the fish is the first thing that the tongue can perceive before chewing begins. When eating sashimi, soy sauce and wasabi can be combined and then the fish dipped (because sashimi is not prepared with wasabi already on it). I prepped Tina before we left home and when we perused our menu found a nice guide on how to eat sushi in the back of the menu. In addition to the items previously mentioned, they also ask patrons not to rub their chopsticks together. Our chopsticks were of fairly high quality, but there were still splinters when we snapped them apart - if they don't want us to rub them, then they should have given us higher quality sticks. We picked off the few splinters by hand in deference to their request then ordered a couple appetizers, a selection of different nigiri to try, and ended with a couple rolls. Sake Kama Shioyaki (Grilled salmon cheeks) $10 - This was excellent - the cheek meat was buttery, succulent, and strongly flavored (a pleasant fishiness). Along with the cheek came an ample amount of salmon steak which was also cooked just through (but not any further). 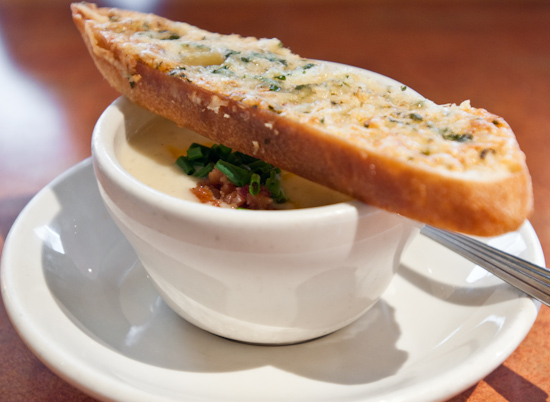 This was a great way to start the meal, and I wouldn't hesitate to order it again. 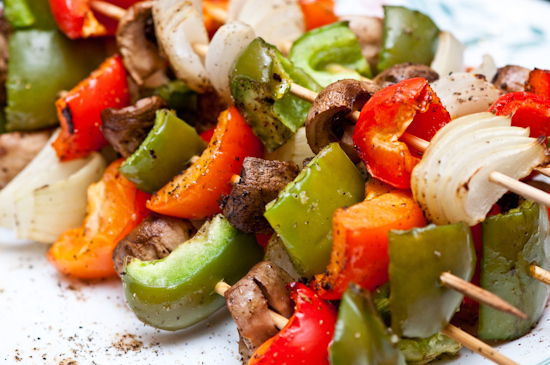 Dinner: I grilled two beef chuck steaks along with mushroom, onion, and bell pepper shish kebabs and sweet potatoes. 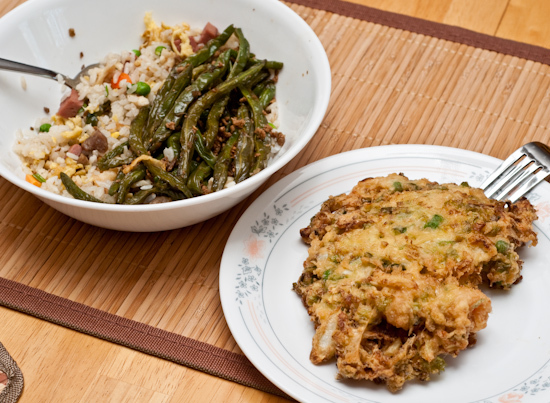 Lunch: Ate left over Chinese food - that weird egg foo young, fried rice, and green beans. Dinner: We watched Avatar at the Alamo Drafthouse. I ate a Chinese Chicken Salad during the first hour of the film (it was a little overly dressed - the salad not the movie - and had too many onions). 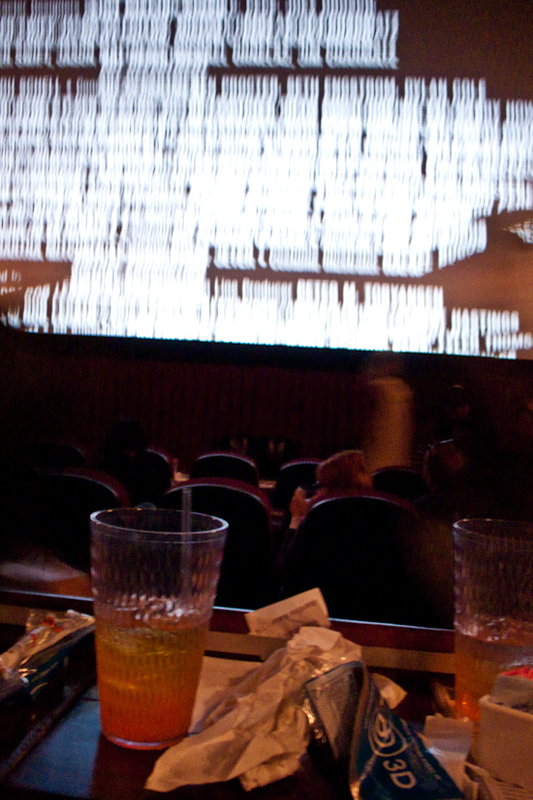 Since it's dark in the theater and they frown on cameras, there's no picture of the meal - but here's a shot of where I ate the meal once the lights came back up during the credits roll.